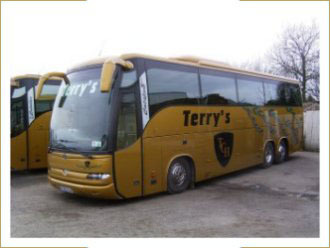 This is a small gallery showing a selection of the coaches available within the Terry's Coach Hire fleet. 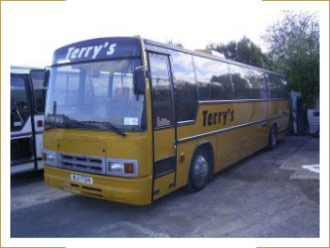 We hope to provide a detailed gallery of all the coaches available for hire within the near future. In the meantime, please don't hesitate to call, e-mail or visit our maintenance centre in Coventry. 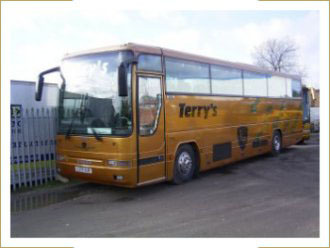 If you wish to view our coaches it is advisable to contact us before you travel to ensure the vehicle/s you wish to see are in the garage. Due to the demand our newer vehicles have experienced it is recommended to use the pictures within this site as a guide to what style and quality of vehicle we operate. 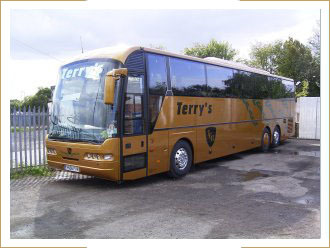 Our touring fleet is amongst the best when it comes to passenger comfort and safety, all vehicles are fitted with seatbelts and our preferred choice of MAN/NEOPLAN chassis specifies both ABS & ASR as standard fit for enhanced passenger safety. 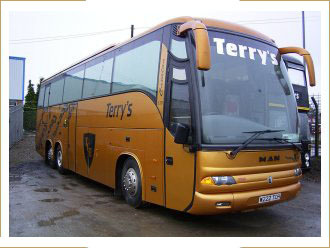 Our other coaches comprise of other popular coach chassis choices such as MAN, Volvo B10M & Leyland Tiger. 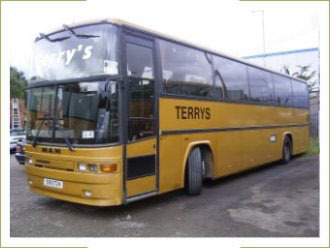 These coaches also feature ABS and exhaust brake retarders for your travelling safety. Our entire fleet is speed limited to 100km/h (62mph) - This is a legal requirement for all passenger carrying vehicles with more than 16 seats. 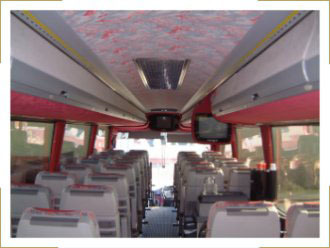 Below is an interior shot of one of the several MAN Noge coaches we operate. All seats are reclining with lap type seatbelts - The type you get in an airliner. Our clients have started to expect much more than just seats when travelling in the 21st century! Climate controlled heating/ventilation in addition to toilet, hot/cold drinks facilities and an array of audio-visual equipment now feature as must have items. 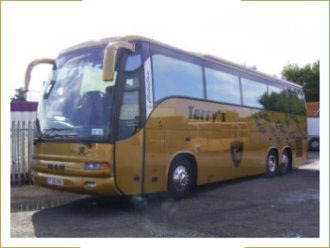 In recent times Terry's Coach Hire has undertaken an upgrade of its coach Audio-Visual equipment with all executive class coaches now being fitted with DVD players and most with twin video screens. Some of our coaches now also feature 10CD Autochangers that can be packed with hours of quality audio to further enhance your journey. 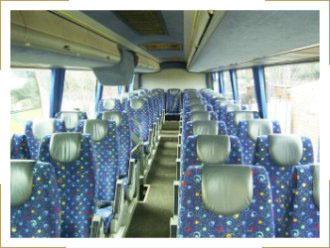 Below is another interior image showing some of the fitments expected in a modern executive coach.